Responsibly Raised: means taking care of our animals. • Cows and sheep graze pastures and eat hay exclusively, the food that best suits their ruminant stomachs. • Cows and sheep range across open pasture from birth to market, rather than live in confinement. This allows them to stay healthy and live free of antibiotics. • Cows, sheep and pigs grow naturally, at nature’s pace, without growth-producing hormones. 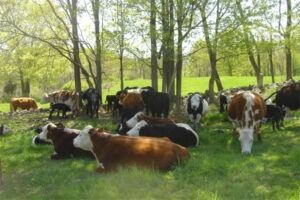 • Cows, sheep and pigs live outdoors in Lowland Farm’s fields and woods during spring, summer and fall. Pigs shelter in barns in winter. • Pigs live on the fruits of their foraging and feed that is free of antibiotics and other supplements. • Living in the open air, pigs enjoy their natural activities: rooting and running, digging up the soil to select the natural nutrients their bodies need. 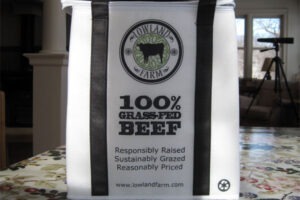 Sustainably Grazed: means taking care of the land. • Our farm is a mixture of rolling upland pastures and woods, and bottom land (“lowland”) along Pochuck Creek, part of the Walkill River system, which flows north into the Hudson River. It is bordered by a large area of undeveloped land that stretches south to the Appalachian Trail and Wawayanda Park, and is home to a wide range of wildlife in addition to our cattle. • We rotationally graze cows and sheep on our rolling pastures, which keeps them healthy and minimizes the need for tillage and risk of erosion and silting of Pochuck Creek. • We rotate pigs through sectioned woodland, allowing them to selectively clear forest underbrush. • We fence the cows, sheep and pigs back from streams and wetlands to further protect these important resources. Reasonably Priced means we do not think that “local and natural at any price” is a sustainable approach. • Growing beef, lamb and pork locally and processing it in a small plant costs more than industrial-sized operations. • While our meat costs more than supermarket meat, we try to keep the differential as small as possible. • The result is uncommon value.